Five years ago, Gabis discovered that from 1941 to 1943, her grandfather had been the chief of security police under the Gestapo in the Lithuanian town of Svencionys, near the killing field of Poligon, where 8,000 Jews were murdered over three days in the fall of 1941. Gabis felt compelled to find out the complicated truth of who her grandfather was and what he had done. 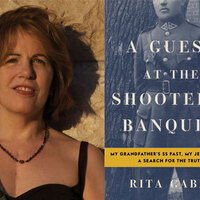 Built around interviews in four countries, A Guest at the Shooters' Banquet is a history and family memoir, documenting "the holocaust by bullets." Rita Gabis is the author of two books of poetry and co-author of a book on the craft of writing. She teaches creative writing at Hunter College. The Schapiro Lecture Series is sponsored by a bequest from Mrs. Gloria L. Schapiro.